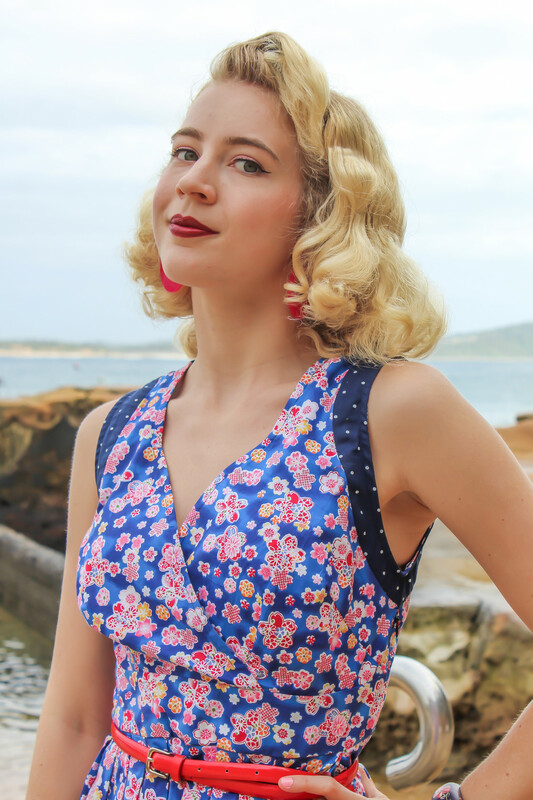 Get ready to turn heads in our fabulous Exclusive Japanese " Sakura" print teamed with a Navy spot trim .The Rasaleela Paloma dress is a timeless 50’s favourite, so flattering and easy to wear. The crossover bodice with the Navy Spot print trimming the arm holes , back neck and main hem along with darting and pleating on the bust for a perfect fit. The A-line, generously sized pleated skirt glides over the hips creating a flared look and is a flattering mid length. The Rasaleela Paloma 50’s dress is also fabulous for trans-season wear, as teamed with a cardi creates a classic look. In the cooler months the Paloma dress looks fantastic with tights and boots.